I have been getting questions related to the installation of the Express Tools in the 2006 products, well actually the lack of installation of the Express Tools Menu. Just try typing in EXPRESSTOOLS at the command line. Custom User Interface Load is a new function that replaces the MENULOAD command. In fact if you type MENULOAD it does a CUILOAD. Same dialog box. Next click the Load button and the Express Tools should be on your pull down and the Toolbars should be available. It will also be listed in the Loaded Groups area also. I followed your procedure, and I got three or four toolbars with “?” marks instead of the command icons. I “x” them out. I do have a new “express” column in my menu but I keep getting an “unknown command” message on each one I have tried. They al have the same “?” instead of the corrects icon. I am running ADT 2006, single installation. I to followed your instructions and I am getting the exact same results as the fellows above me. IF YOU HAVE 2005 STILL AROUND, JUST LOAD THAT MENU AND ADD THE EXPRESS FOLDER TO YOUR SEARCH PATH, otherwise you’ll get ???? toolbars and nothing will work. I uninstalled acad 2005 but I still have the “?” marks in 2006 express tools. Any idea how to fix this? What I have to do? I am going crazy! Maybe becouse i still have 2002 arch. descktop installed. I’m using ADT2004. My express pulldown, and express toolbar both show, but when I try to run anything on them, I get an unknown command error. Any Ideas? typing EXPRESSTOOLS worked fine with my instalation of ADT2006. Where can I find the answers to these problems? i have a problem…. i clik on any command, like isolate, and then “failed” anyone knows what happens here????????? im poing crazy without my isolate layer!!!! go to add/remove programs and modify my install of ADT 2006 to include the express tools. (I didn’t install it origionally) once the install finished the EXPRESSTOOLS tools command work and I had the tool bars. they all show “?” on the buttons but the all function. working on a way to fix that… any suggestions? go to add/remove programs and modify my install of ADT 2006 to include the express tools. (I didn’t install it originally) once the install finished the EXPRESSTOOLS tools command work and I had the tool bars. they all show “?” on the buttons but the all function. working on a way to fix that… any suggestions? I have the same problem. CUILOAD works great, but all my Express icons have question marks on them and they commands don’t work either. I have the Express folder and the acetest.fas file from ADT 3.3 if that can help me. Any fix without having to go to the basement to get the disks? Please email me if you can help. 1. 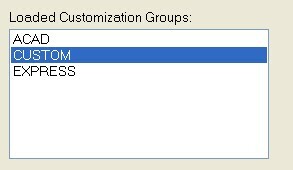 Right Click on one of the question marks in the express tools toolbar and select ‘Customize…’ to bring up the ‘Customize User Interface’ window. 3. Expand the ‘+Toolbars’ and then expand the ‘+ET:Layers’. 4. Click the first command in the starred list, which should be ‘Layer Manager…’ . This will display its properties in the lower right pane. YOU ONLY HAVE TO DO THIS ONCE. Leave all the others as they are, with UPPERCASE extensions. 6. Click the ‘Apply’ button, then click ‘OK’ to exit the window. 7. The icon images should load now that ACAD has recognized them. This worked for me and everyone else in my firm. Hope it works for you too. I am having the problem the others are having with the express tools. I worked through your solution and it didn’t work for me. I have two computers; one with 2000 / adt2006 and the other with only adt2006. I can’t get either one to work the express tools. Does any else still have this problem or another solution? I had the same problem. In my case it was because express tools were not installed, or not completely installed. Open your control panel and click add/remove programs. Select Autodesk Architechtural Desktop 2006 once the list is populated and click on the change button (This may require administrative privelages). Click the “Add or Remove Features” radio button and click next. On the next screen, expand the “Program files” drop down menu and click on “express tools,” then from this drop down menu select “entire feature will be installed on local hard drive.” And click next. Click next once more and the feature should auto-install itself. On solving the “QESTION MARK” icon issue: Adam’s suggestion on changing the BMP to lowercase “bmp” worked ! And if “expresstools” or “expressmenu” commands doesn’t load express tools, this means you have to install it by going to ADD / REMOVE programs as suggested by the others. I had this problem at three different places. The worst was on my laptop. The solution here is to run the installation again as pointed out earlier. with the “express” option selection while changing the installation. Once this runs, and your problem still persists, then it is because – the re-install does not correct you acetmain.cui file, instead it provides you with an alternate installation that is within the adt.cui file. You will have to unload the express cui you installed using the acetmain.cui file and just turn on the express toolbar that is now embedded in the ADT toolbar menus itself !!! Thanks for all the help fellas..! hey guys thanks for all the tips.. there is one more point that needs to be understood. The re-installation using the change option through the Add/remove programs menu on the Control Panel is the surest way to do this. the only thing though is it does not correct the “?” that appears in the toolbar created by loading the acetmain.cui file. You will have to unload that once you have run this installation. The new installtion has the express tools installed inside the adt.cui file that is already on your CUI .. all you have to do is go and select it. This works..! Hope this helps those of you who are still trying..! I experienced the same for Autodesk Building Systems 2007. The easiest fix was to go to control panel, add/remove programs, click on Autodesk 2007, click on ‘change’. Pick add/remove features. When the list populates make sure ‘entire feature will be added to hard disk’ is clicked. Express tools should be part of this selection. Click ok and it will ask you for the CD installation. Once it is installed and finished you can launch Autodesk. Right click on an icon and choose customize. In the upper left window make sure ‘all customization files’ is chosen. Click on the default Workspace file (upper left window). Then on the upper right window click on ‘customize workspace’. Then mouse over on the upper left window down to Partial CUI files. Click the plus sign and click the plus sign on Express Tools. Check mark Toolbars and Menus under Express tools. Mouse back over to the upper right window and click on ‘Done’. Click on Apply and go back to Autodesk working environment. You should have Tools on your menu (top of screen) and the express toolbars. The toolbars may have question marks in them. To fix this, right click on an icon and choose customize. In the lower left window click on express tools commands. Single click on one of the commands and look over in the lower right window. For the small and large image section there should be a file listed for each. Click on that file name and change the BMP to lower case bmp. Click on apply and OK and go back to your drawing enviorment. Icons should be showing. Trying to just fix the icons and not making the re-installation adjustments does not work. This must be done in order. If you don’t see express tools, it’s because they’re not installed by default installation. Put in your ADT2006 Disc 1 Go to Control Panel > Add/Remove Programs > Arch Desktop 2006 > change > pick Express tools to install. In Vista, Control Panel Programs and Features > change (on top of window) > Arch Desktop 2006 pick Express tools to install. Same fix above goes for if you get Express Tools Menu and Toolbars with unknown commands and bubble cloud question mark icons. finally i got that expresstool tool bar..
but express toll command it’s not wokring. In the OPTIONS Menu , Add the Path ” C:\ProgramFiles\AutoCAD2006\Express ” (without Quotes) to Support File Search Path. I did not previously have this problem—now some of the icons on one of the tool bars shows a bunch of question marks? DLEAL, thank you so much, it worked!!!!! Any suggestions from anyone out there? This feature will remain uninstalled. This feature requires 0kb on your hard drive.